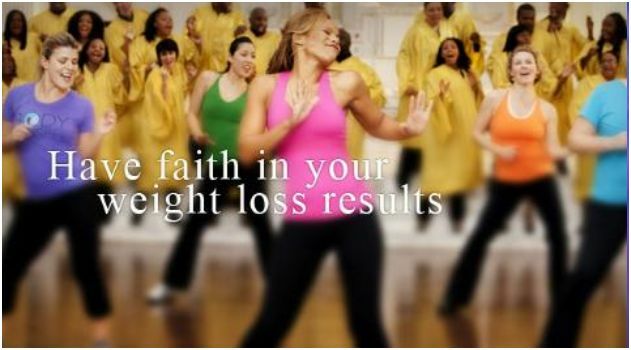 Body Gospel®: Have faith in your weight loss success. At last, you can combine the power of your faith with your desire to lose weight and get fit. Body Gospel is a first-of-its-kind program that includes workouts set to inspirational gospel music, breakthrough new resistance bands, and a complete nutrition plan created by fitness icon Donna Richardson Joyner. She shows you how to combine this effective program with your faith in God to transform your body and your life. With glorious music guaranteed to get you moving, every workout is a “party with a purpose,” and the results will amaze you. Faith, Fitness, Nutrition—the Body Gospel workout. Whether you have 40, 30, 20, or just 10 minutes, Body Gospel gives you uplifting workouts set to foot-stomping gospel hits. Anyone—from beginner to advanced—can do these workouts and see results. Body Revival: This calorie-blasting cardio workout lifts your spirit, slims your body, and leaves you feeling energized all day long. Core Revelation: Lose those love handles and define your abs while slimming and trimming your thighs and backside. Stretch in the Spirit: Increase your flexibility, reduce stress, and breathe new life into your healthy temple. Gospel Glory: An advanced body-slimming cardio workout to help shrink your hips and thighs, and flatten your tummy. Strength & Spirit: Alternates between strength and cardio training for maximum fat and calorie burning. Sculpt and tone your body from head to toe. Total Transformation Guide: Includes a 30-day workout calendar, goal-tracking journal, and daily scripture to help strengthen your faith in God and yourself. Feed Your Body, Feed Your Soul Nutrition Guide: Lose weight and have more energy with Donna’s delicious and filling recipes for meals and snacks. You’ll stay satisfied and on track without feeling like you’re on a diet. Body Gospel® Training Cards: Perfect for beginners or people on the move for a quick workout on the go—any time, any place. Body Gospel Bands: Pro-grade resistance bands that will help you engage your core and upper and lower body–all at the same time. You’ll sculpt and define long, lean muscles with these breakthrough bands. 24/7 Online Access: Body Gospel online is truly a fellowship of fitness. Join live chats with Donna and other Body Gospel users, plus you’ll get free training tips, nutrition tools, and personal assistance from our online Coaches. You’ll also get 3 bonus gifts—an $80.00 value—FREE! Bonus #1 – Stepping in the Spirit: An inspirational walking workout set to uplifting gospel hits. Donna motivates you every step of the way toward your weight loss success with this 20-minute walking program. Bonus #2 – 3-Day Jump-Start Plan: Lose up to 3 pounds and 3 inches in just 3 days with this safe yet effective quick-start program. Your results are guaranteed or your money back! Bonus #3 – Body Gospel LIVE! : It’s a “party with a purpose” and you’re invited! Feel the power of working out with a live gospel choir right in your own living room. With this energetic, fun-filled workout, you’ll be sweating in the spirit in no time! Body Gospel Bands contain natural rubber latex, which may cause allergic reactions.